Emma Clark designs gardens with a fundamentally spiritual and holistic outlook, undertaking them for private clients and public institutions, both in the U.K. and abroad. 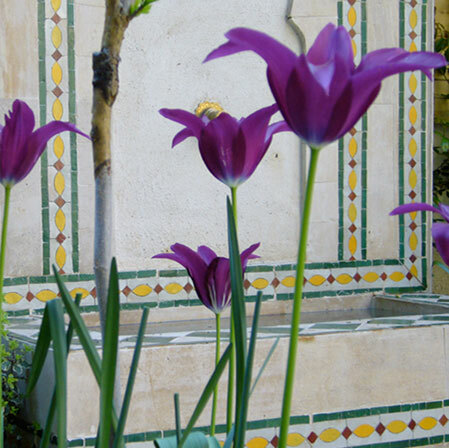 She specialises mainly in Islamic gardens, focusing on contemporary interpretations of traditional principles. NEWS 2018-2019: Emma continues to lecture regularly on various aspects of the Islamic garden including one at the Shaykh Zayed Mosque Abu Dhabi where she was interviewed and filmed (November 2018); one at a Conference in Konya, Turkey, May 2018; and another at a Conference at Brunei Darassalaam University, March 2018. UPDATE 2019! Emma designed the Islamic Garden at the new Cambridge Mosque and at last, after many years of design and build, the Mosque (Marks-Barfield Architects, designers of the Millennium Wheel) will be opening this coming May 2019. The garden has been designed in association with Urquhart and Hunt Landscape design and goes on site over the next few weeks, February 2019 – an exciting time! 2018: You may still be able to find Emma on ‘Monty Don’s Paradise Gardens‘ first shown on BBC2 Jan 19th and 26th 2018.